Marvel is bringing its big guns to Free Comic Book Day, offering a special teaser issue for its incoming event series Civil War II. It’s not just a preview either, but a whole new story that sets up the future conflict between the heroes of the Marvel Universe—and introduces the new Inhuman that catalyzes the event, Ulysses, who can predict future events. Also included is a bonus story set in the All-New, All-Different Avengers comic that introduces to the world to the mysterious new incarnation of the Wasp. One of two Dark Horse offerings this year, the publisher leverages its biggest licenses for a trio of all new stories. The Aliens tale is set in the world of Dark Horse’s brand new series Aliens: Defiance, while Mike Mignola flashes fans back into an untold chapter of Hellboy’s history—but the big draw here for many will be a brand new tale from the universe of beloved cult classic Firefly from Chris Roberson and Stephen Byrne. Joss Whedon even “executive produced” the story, in so far as one can executively produce a comic. But it means it’s the real deal! Rom is back in action! Decades after the classic Marvel comic that brought Hasbro’s weird scifi toy to life came to a close, the Space Knight now has a new home at IDW. There are deep reaches of space to explore and Dire Wraiths to do battle with, and it all begins with this free prequel issue ahead of the Rom series beginning in July. On top of an all-new story, the issue also comes bundled with previews for some of Valiant’s recent new series—everything from the hilarious adventures of Archer and Armstrong to a new look at the upcoming Faith ongoing series. Fans of the blockbuster manga and its wildly successful anime adaptation will want to check out this first look at Kodansha’s brand new comics anthology. It’s a collection of new tales from the bleak world of Hajime Isayaba’s manga, but with a twist: they all come from some of the finest writers and artists in Western comics, giving us a take on Attack on Titan quite unlike anything we’ve seen from the series before. When I said Marvel are bringing out their big guns, I really meant it—not just content with teasing its massive summer event, they’re also offering a primer for the new Captain America comic, starring the recently rejuvenated Steve Rogers back in action as Cap, doing what he does best: smacking Hydra goons with his shiny new shield. Alan Tudyk comes to the world of comics, to co-write a new miniseries based on the scifi show-within-a-show from his geeky webseries Con Man, following the adventures of Captain James Raaker (played by actor Jack Moore in the world of Con Man, and by Nathan Fillion in our own). The four-part miniseries is coming later this year, but you can read the prequel issue for free tomorrow. Fans of Avatar: The Last Airbender should be already well aware that the comics offer some brilliant insight and new stories in the Avatar universe, straight from the show’s creative teams, so aside from being a damn good offering for youngsters, this’ll be a must-read for Legend of Korra fans. Black Mask Studios’ free comic offers two short stories set in the worlds of two of their biggest hit series: the outstanding teen superpower tale We Can Never Go Home, and its brutal conspiracy thriller Young Terrorists. Both are great, but the real star here is the We Can Never Go Home tale, which sets up the second run of the series—another one of our favorites of 2015—beginning later this year. What comics are you looking forward to picking up this year? Let us know in the comments! 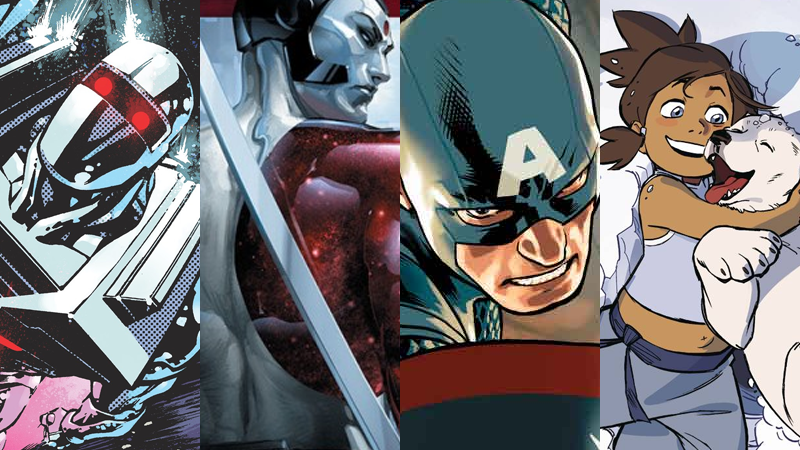 Meanwhile, you can find a complete list of every comic available this year here, as well as more details on events taking place to celebrate the day over on Free Comic Book Day’s website.